Philips says its 276E6 display is the world's first 'quantum dot' monitor, and it's designed to deliver pro-quality colors at a consumer price point. This short video review shows how the E6 shines — and where it falls short. Anyone who's recently shopped for a new display knows they typically don't come cheap. If you want a large HD display with the latest screen tech, you're very likely going to pay top dollar. However, Philips, known more for personal gadgetry and home appliances — such as beard trimmers, electronic toothbrushes and espresso machines — than PC hardware, came up with a unique compromise, using a new screen technology: the $299 Philips 276E6 QD display with "quantum dots" (QD). 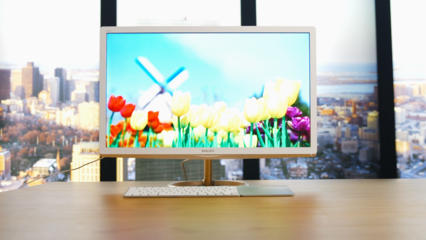 Philips says its display is the first monitor to use QD technology. I was curious about these newfangled techno dots, so I used the 276E6 monitor nearly every day for the past month -- writing, editing, manipulating photos, riding the Interweb waves and occasionally watching "Silicon Valley" on HBO Now. I found a lot to like, but Philips had to make some obvious sacrifices to hit the $300 price point. Check out my "rapid review" video below for specifics.